” I’m selling a VC Bend by Pittsburgh Modular. The module is functioning properly. Ich verkaufe einen CV und Audio Prozessor Pittsburgh Modular VC Bend in voll funktionsfähigem Zustand. Einwandfreier Zustand mit den üblichen Rackeinbauspuren. Bezahlung per Überweisung oder Paypal möglich oder Bar bei Selbstabholung. ” I bought these new from Analogue Haven, great cosmetics condition, perfect working order, I just wanna get into other oscillators. “Hello there! you are about to bid on the Pittsburgh Analog Delay! I haven’t owned this module for long, and it has been very well cared for. After getting my Echophone I couldn’t justify two delay modules, and this one unfortunately didn’t make the cut. That being said, it is a wonderful module with a lot of character and I’ll be sad to see it go. 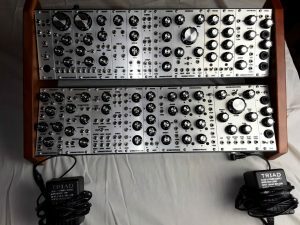 “Selling my Pittsburgh Modular Modules – Got to pay the Bills! All bought withing the last 4 Months and hardly used – in basically new condition w/ original boxes. All Modules Pictured Below (Happy Ending Rack pictured here available as well – inquire if interested.) Will include Patch Cords. “Light use in project home studio, so light rack rash.” Auction ended. Click here to browse on eBay. “This is my Pittsburgh Modular Timetable. Purchase will include the Mod Pack that I purchased and never used. See more about the Mod Pack below. The unit is almost new with no scratches or tarnishing. Only the slightest amount of rash is viewable at the screw holes from mounting. It has been in my smoke free home since I purchased it and mounted in my modular percussion case which I am now breaking up. ” Auction ended. Click here to browse on eBay. “Nice used Pittsburgh Modular Analog Delay module. This module was used very little and works perfect. Sorry the picture isn’t very good. My camera is acting up. Auction includes the original box, power cable, and 4 mounting screws.” Auction ended. Click here to browse on eBay. “Lightly used and in excellent condition. Shipping to the US only. Yellow led version (purchased directly from Pittsburg Modular” Auction ended. Click here to browse on eBay. “Lightly used and in excellent condition. ” Auction ended. Click here to browse on eBay.